← Is Cow’s Milk Really Safe? Apples give us lots of fiber and nutrients and help stimulate bile production, which the liver uses to release toxins. The soluble fiber in apples, pectin, is helpful in removing heavy metals and food additives from our bodies. Be sure to eat only organic apples because regular apples are laden with pesticides. Artichokes increase bile production and both purify and protect the liver. They also have a mild diuretic effect on the kidneys, which aides in toxin removal once the liver breaks them down. Some studies have shown that artichokes may actually regenerate liver tissues. They are also high in fiber which help us with elimination. Asparagus detoxifies the body, it can help you wage the anti-aging battle, protect you from getting cancer, help your heart to stay healthy, and is a general anti-inflammatory food. It’s also known to help with liver drainage, which might sound like a bad thing, but since the liver is responsible for filtering out the toxic materials in the food and drinks we consume, anything that backs up its drainage is not doing you any favors. High in fiber and is an antioxidant. To maximize the benefits of avocados, choose organic avocados and eat them without any other ingredients to get the full benefit of their healthy content. Beets are full of nutrients and are a great source of vitamins B3, B6 and C, plus beta-carotene, magnesium, calcium, zinc, and iron. They assist our liver and gall bladder in breaking down toxins, and their fiber is great for digestion and elimination. Shredded raw beets are the best. Broccoli sprouts contain important phytochemicals that aid in the detox process at rates much higher than grown-up broccoli. These phytochemicals stimulate detoxification enzymes in the digestive tract. They are also extremely high in antioxidants. Cabbage helps your liver with the byproduct being lower cholesterol, so there is more than one reason to include this cruciferous vegetable. Cabbage also aids in helping you go to the bathroom, which in turn helps you expel the toxins. Chlorella is a single cell algae sea vegetable that grows in fresh water. Chlorella is best known for being able to remove mercury and other heavy metals from the cells. Too much chlorella can produce side effects — mostly in the digestive tract — where it works best to bind to mercury, eliminating it. Start with the lowest quantity and work up slowly for a gentle detox. Cilantro rids the body of heavy metals. The chemical compounds in cilantro bind to these toxins, loosening them from the blood, tissues, and organs and assisting with their elimination from the body. Garlic has powerful antiviral, antiseptic and antibiotic properties. It helps stimulate the liver into producing detoxification enzymes that help filter toxins from the digestive system. Ginger helps the liver function, and has astringent properties. It helps with the digestive tract. Ginger is good for nausea, upset stomach, diarrhea, gas, etc. The fiber and the nutrient-rich juices in a grapefruit pack a nice detox punch and can really detox your body. It’s all about flooding the body with good things for it while helping it dislodge the bad things. Grapefruit also helps with weight loss because of the way it makes the liver burn up fat. The big takeaway on grapefruit is that it gets your liver fired up and ready for action, while infusing the rest of your organs with nutrient-laden fruit juice. Green tea is a great source antioxidants, one of which are catechins. Catechins increase liver function. Plus, drinking green tea aids us in hydrating our bodies. What we want from green veggies is chlorophyll. Chlorophyll rids the body of environmental toxins, heavy metals, herbicides, and pesticides. Make sure you get lots of greens in your diet — leafy greens, broccoli, cucumbers, celery, sprouts, dandelion teas, chlorella etc. Greens are the essential building blocks of any healthy diet because they aid in detox, increase oxygen content, and purify the blood. Kale contains plenty of nutrients and acts as a way to help flush out the kidneys, which must be cleansed if you are trying to detox. Kale is so good for you that it is often recommended to patients that are following a doctor recommended diet when fighting kidney disease. It’s packed with antioxidants and has anti-inflammatory properties as well, not to mention all of the vitamins and minerals it contains. Lemons jump-start digestion by stimulating the release of enzymes. Also, the vitamin C in it helps convert toxins into a water-soluble form that can be easily eliminated from the body. Lemons also help stimulate the liver and purify our blood. This is an herb that is used in Thailand and other parts of the world as a natural way to cleanse several organs at once. It not only helps the liver but also the kidneys, the bladder, and the entire digestive tract. Some of the benefits of lemongrass include a better complexion, better circulation, and better digestion. Olive oil helps with liver cleansing. It has a lot of healthy properties, and makes for a better choice of fat than most of your other options. Just be sure not to cook with it because the heat will change the chemical properties of it. Use it as a salad dress to help things like dark leafy greens go down. Fruit pectin is the most gentle method of detoxing contaminants. Pectin comes from the fibrous portion of the fruit and is most commonly found in the pith of limes, lemons and other citrus fruit as well as in apples. Other sources of pectin are bananas, grapes, carrots, and cabbage. Pectin helps to release heavy metals, chemicals and other substances into the blood stream, where it binds to them and flushes them from the body. Simply eating fruit high in pectin will help to cleanse your system, or you can add a pectin product to a glass of water, organic grape juice or fresh veggie juice to speed the detox process. Beware of pectin sold in grocery stores, as some brands may contain MSG. Turmeric cleanses the liver. It’s said that you can do a detox using just turmeric tea, and drinking it for a week straight along with a healthy diet. Water is important for all of your organs, and for flushing toxins out of your body. If you’re exercising and taking saunas to help release the toxins it becomes even more important to stay hydrated. If you’re not used to drinking water daily, be sure to only increase your intake by one cup at a time so you don’t overload yourself. Your kidneys won’t know what to do if they’re not used to getting water and then get a ton of it. Watercress helps to release enzymes in the liver that clean it out and help rid it of toxic buildup. It is important to increase your intake with as many of these foods as you can. You do not need to eat all of these foods at the same time to gain the benefits. Do the best you can by keeping these foods in mind when consuming foods. Before choosing a particular food, think of which foods or ingredients are going to give you the most health benefits. Alcohol has a very toxic effect on the liver, and will undo all of your hard detox work. It can single-handedly cause a fatty liver, or it can contribute to one. When your liver is taxed your whole body suffers. 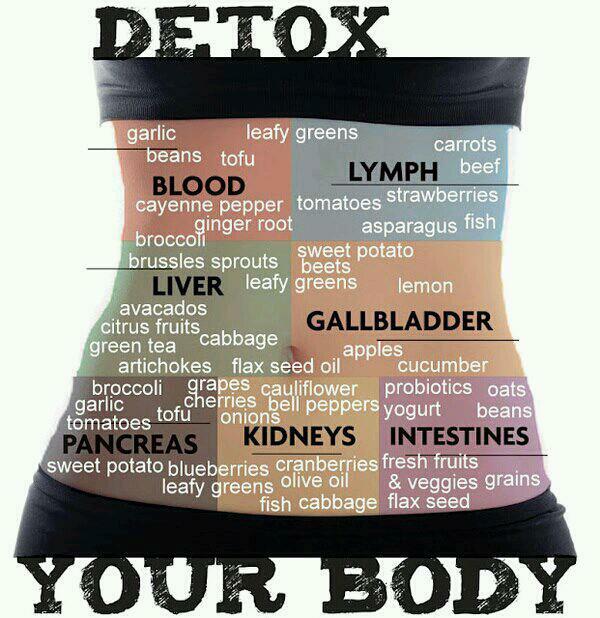 Try to eliminate or at least drastically cut back during any detox program you follow. Beverages with caffeine in them have a dehydrating effect on the body, and make the liver work overtime to process the caffeine they contain. You have to drink plenty more water to counteract the dehydrating effects they cause, so it’s easier to just avoid them while you’re trying to detox. Excess sugar cause excess stress to your liver, and will thwart your cleansing efforts. Try your best to cut out these foods you’re craving. 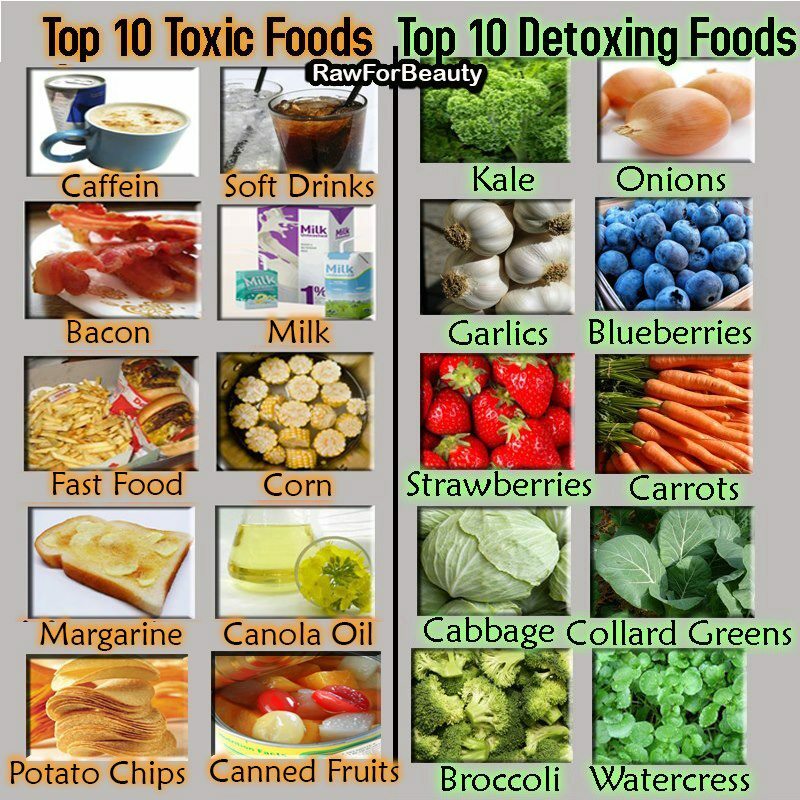 As you release toxins from your body, you’ll crave these kind of foods less and less. Overloading your digestive system leads to things moving sluggishly, and can lead to an accumulation of toxins. While you’re trying to detox you want to make sure that you’re stopping when you almost feel full, and that you’re eating freshly prepared foods that are high in fiber and nutrients, and avoiding processed foods.